All about Indian Astrology, Vedanta, Yoga, Tantra, Martial Arts, Occult and Alternative Medicine. One of my friends loves 'Zen' very much. He has read extensively on 'Zen' and this habit of reading had led him to consider himself a very knowledgeable person in philosophical matters and prompted him to teach others whenever he found an opportunity. One day he invited me to have tea with him. I went to his home at the appointed hour. After exchanging pleasantries, he placed two empty cups on the teapoy and started pouring tea from a kettle. He kept on pouring tea, though it was overflowing from the cup. I was silently watching him and instantly sensed that he was imitating the famous 'cup of tea' incident of Zen. I could see he was trying to pose as the famous Zen master Nansen and teach me a lesson in Zen philosophy. But he could not understand that I am not the professor of the story. "What is the fun? The cup is overflowing. Why do you keep on pouring the tea?" I asked him. "When your cup is full, how can it hold my tea?" he questioned, as expected. He was just enacting the old incident again. I thought the time is right to let him understand the truth. 'I know the Zen story you are referring to. Tell me. If my cup is really empty, where is the need for your tea?" My friend was puzzled and had no answer. The original incident happened in China. But this incident happened in India. This incident reflects the way of those who read books and assume that they realized everything. Such people may dupe the innocent, but their intentions are clearly seen and exposed in the presence of those who know better. Spirituality is never experienced through book learning. You can know the way from books. But it is the steadfast practice of a method for years that brings you the experience. There are plenty of people who just read Zen or Osho or Ramana or Jiddu or some other spiritual master and assume they have come to know everything. These people have to understand that the great souls practiced sadhana for years and years before they started teaching the world. They never talked to the world during their sadhana. They started talking only after realizing the truth by experience. But those who read the books, never bother to understand this point.They just try to repeat like parrots the sayings of great sages. There is a great difference between mere book learning and experience. Books never give experience, but experience can result in many books.Genuine spiritual experience can have many shades which are not seen in books. The book learners may understand the grammatical meaning of texts. But grammar seldom gives experience. One needs sadhana to convert a thing understood by the brain into experience. This is the difference between scholars and Sadhakas. Jillellamudi Amma, a great sage of modern India, used to say ' Books never give experience, experience gives many books". Experiential knowledge always outshines bookish knowledge. Experience is ever new and book knowledge is dead and inert. In the original Zen story a professor goes to a Zen master to argue with him. The Zen master, indicates to the professor by pouring tea in the full cup, that an overfilled brain cannot grasp a new idea. My friend tried to enact this incident again, thinking that I am not aware of this story. There are many people who after seeing movies are influenced by the movie stars so much so that they try to imitate them in real life and face unpleasant situations thereby. Spiritual book learners are no better than movie goers.We need not imitate others. We have to be ourselves. Life is ever new. It always brings new situations and new flavors to our door step. That is why we never find any newness in an incident again and again. It is true that an overfilled cup cannot hold anything more. But when the cup is really empty, what is the need to pour tea into it at all? An empty cup indicates an empty mind devoid of thoughts. When the cup is really empty of thoughts and samskaras, there is nothing more to achieve. There is no need to pour tea into it. The game is over. The empty cup may seem to be empty, in reality it is not so. It is filled by the whole space above it stretching up to infinity. When you reach a state where you can empty your mind of all thoughts, you dont need any outer supply. Nature herself supplies you with ideas unceasingly. Sri Ramakrishna also used to say the same thing. " In a store of grain, as you pull the heap of grain forward, the grain that is lying in the back automatically comes forward into your reach." It is similar. One never feels the paucity of ideas, if one could connect to the universal storehouse of ideation. My friend tried to imitate the Zen monk. But in spiritual life, no imitation is needed. One has to act as per one's experience. We have to stand on our own legs. Only then, we can have purity in our behavior. The Zen story of Nansen was original. This is just repetition of the old story. So this is fake. Even in a fake incident, it is possible to bring freshness, if you know the knack of experience. There are many teachers in this world, who just read books and try to teach others. All the today's corporate gurus freely borrow from ancient literature, but very few quote the original source. Teaching from books is not difficult, it is very easy. Teaching from one's own experience is difficult. One has to struggle and do sadhana for years, to gain experience. First one has to do sadhana, then if necessary one can teach others. This is the correct sequence in spiritual life. Show of scholarship always falls flat in front of genuine spiritual sadhakas. Humility finds a good friend in spirituality but haughtiness is automatically shown the door. It cannot enter the house of true spiritual wisdom. 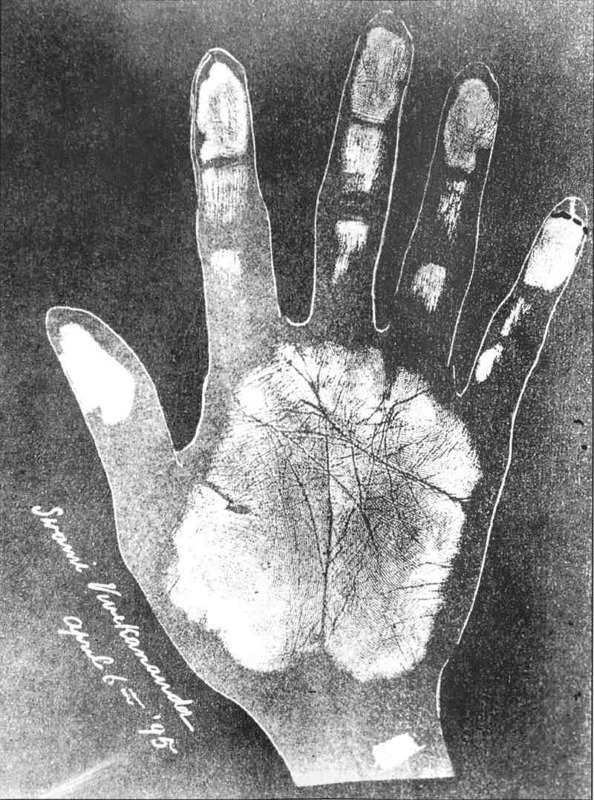 This is the palm print of Swami Vivekananda. It was taken on 6-4-1895 and presented by 'Chiero' in his book. Let us analyse the palm print of this great sage of modern India. At the outset, we can see that this palm belongs to the 'philosophic palm' group with a mix of practicality, because of the square shape of the center of his palm. This indicates that Swami has refined philosophical bent of mind with a practical outlook. Mysticism and practical leadership qualities co-existed in him. His lifeline is short. It has travelled well into the middle of his palm along with his heart line. We can see the formation of 'tangle' in this area and also an 'island'. We know that he lost his father in his youth leaving the family in utter penury. Owing to his short lifeline, the Swami died at the young age of 39. His Venus mount is well formed. He was an excellent singer. He could also play well on harmonium, tabla and tambura. According to sources, he had a sweet and enchanting voice, natural to yogis. He sang the song 'O mano, chalo nija niketane' ( O mind, go to your own place) in the presence of Sri Ramakrishna, which sent the Master into Samadhi state. Most of the Venus mount is under the control of his thumb, which shows that his musical talents are under the control of his Soul. This is the basic difference between a person talented in fine arts and a yogi. A musician, for example, may or may not have self-control, but a Yogi without self-control is not worth his salt. In a person's hand, Self control and Soul power are denoted by the thumb. The low set thumb of Swami indicates his soul power and broad outlook. Well formed Jupiter's mount indicates his deep philosophical nature. The 'ladder' in his Jupiter mount shows his spiritual ascent into the higher realms. 'Solomon's ring' is not clearly visible in his hand due to poor print quality, but it might have been there, in all probability.Many yogis and mystics are seen to possess this sign invariably. Fate line stopped below the heart line. So the Swami never ventured earning money for his sake, true to the tradition of ancient Indian Saints who take poverty as a rule of spiritual life. The head line, crossing fate line, is slanting towards mount of Moon. The connection between fate line and Moon's mount shows that Saturn and Moon are together in his birth chart. This yoga gives, among others, a tendency towards renunciation of pleasures and consequent mystical bent of mind.The head line, though tilting towards Moon's mount has become weak in the end. This indicates that, though the Swami had high emotional nature, it is well under his control. The heart line spreads into 5 branches, out of which, one goes to Jupter's mount and the others go to Saturn. This is an indication of religious and yogic stature. This sign resembles a five-headed serpent indicating the awakened Kundalini Shakti in the Swami. The circle of Moon on the Saturn's mount reveals a stunning fact that Saturn and Moon are together in the Swami's birth chart. Indeed they are together in his chart in the Kanya Rasi. Many times, indications from the palm reinforce those available in the birth chart and vice versa. This sign gives out very promising results in spiritual life i.e self realization,God realization, supernatural powers and a genuine spiritual perfection. Such persons possess the power of Vak-Siddhi. Whatever they say comes true.They have the power to alter 'fate' according to their will.We can recognize such persons to be true and genuine gurus. The lines projecting from heart line towards mount of Sun are like a cup. This shows his acquaintance with kings and saints. We know that he possessed a royal build. These lines start from Ketu mount and show that his acquaintances have roots in spirituality. The mystic crosses between his head and heart lines point towards supernatural powers possessed by the Swami. The symbol of 'mystic eye' in his hand shows that he had divine clairvoyant vision. Two horizontal lines on the mount of Moon indicate his two foreign trips. Weak and criss-crossed health line shows his delicate health in the ending years of his life. He suffered from hypertension, diabetes and asthma in his later years. It is difficult to imagine more results from the poor quality of this palm print. However, from this reading, we can see that palm reading gives very accurate results. Astrology also gives accurate results. But the astrologer's task is much more than that of a palmist.In Astrology, one has to intelligently blend the qualities of houses, rasis and planets. In addition, mathematical deductions play a major role in astrology, be it computation of various dasas or other calculations. Palmistry is mastered easier than Astrology, but intuition plays an important role in both these occult arts. What happened in Panchawati in 2018?